Someone just have a new baby girl? What could show your excitement more than sending this arrangement filled with pretty pink and white flowers? 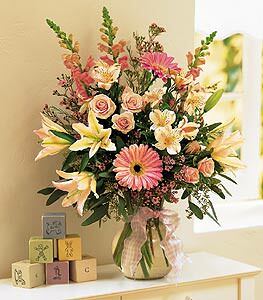 Alstroemeria, gerberas, lilies and roses arrive in a clear glass vase tied with a pink bow.